Saturday December 26th 1891 It was a very cold day. Mother and I worked at the quilt the most of the time. We did not do very much cooking. I sewed carpet rags in the evening. Will went to town. 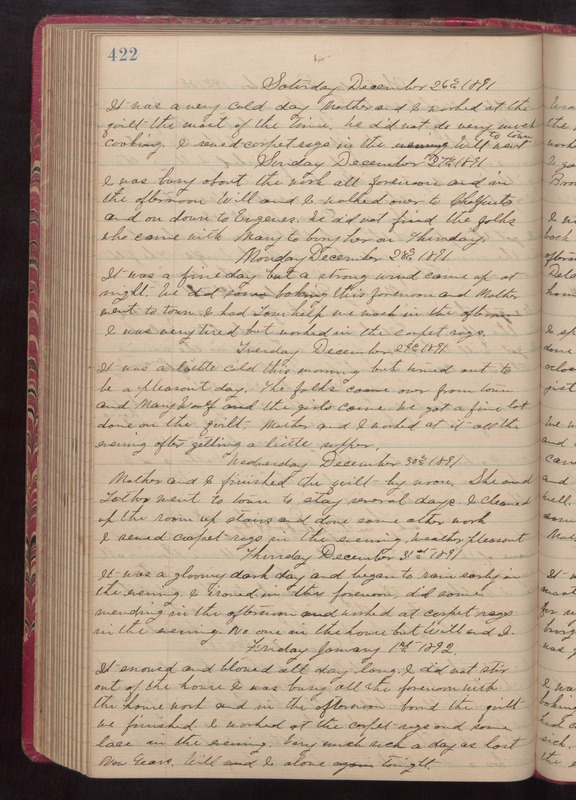 Sunday December 27th 1891 I was busy about the work all forenoon and in the afternoon Will and I walked over to Chalfants and on down to Eugenes. We did not find the folks who came with Mary to bury her on Thursday. Monday December 28th 1891 It was a fine day but a strong wind came up at night. We did some baking this forenoon and Mother went to town. I had Tom help me wash in the afternoon. I was very tired but worked on the carpet rags. Tuesday December 29th 1891 It was a little cold this morning but tunred out to be a pleasant day. The folks came over from town and Mary Woolf and the girls came. We got a fine lot done on the quilt. Mother and I worked at it all the evening after getting a little supper. Wednesday December 30th 1891 Mother and I finished the quilt by noon. She and Father went to town to stay several days. I cleaned up the room up stairs and done some other work. I sewed carpet rags in the evening. weather pleasant. Thursday December 31st 1891 It was a gloomy day and began to rain early in the evening. I ironed in the forenoon, did some mending in the afternoon. worked a carpet rags in the evening. No one in the house but Will and I. Friday January 1st 1892 It snowed and blowed all day along. I did not stir out of the house I was so busy all the forenoon with the house work and in the afternoon bound the quilt we finished. I worked at the carpet rags and some lace in the evening. Very much such a day as last New Years. Will and I alone again tonight.